Eddie Kramer, South African producer and engineer, is celebrating his 77th birthday today. Regarded as a true rock icon, Kramer is known for working with some of music history’s biggest names including The Rolling Stones, Eric Clapton, David Bowie, Bad Company, The Beatles to name but a few. He is also celebrated for his long-term associations with Jimi Hendrix, Led Zeppelin and Kiss. The South African moved to London where he began his recording career at legendary studios including Pye Studios, Regent Sound and Olympic Studios. Kramer engineered Jimi Hendrix’s “Electric Lady Land” LP in 1968 at the Record Plant in NYC where he also worked with Joe Cocker, NRBQ and The Vanilla Fudge. Kramer and his crew are also famous for recording the whole 1969 Woodstock festival. The studio became known as one of the world’s most popular recording studios. In 1969 he went independent where he produced Johnny Winter’s first LP and engineered “Led Zeppelin II”. In the same year, Hendrix hired Eddie to build an exquisite art studio, Electric Lady Studios, where he served as Director of Engineering from 1970 -1974. He has also worked on live recordings by Kiss, Led Zeppelin, The Rolling Stones, Joe Cocker, Curtis Mayfield, David Bowie and Peter Frampton. Kramer has won several Grammys for his audio production of the video Jimi Hendrix live album The Band of Gypsies, “The Game of Love”, with Carlos Santana and vocals by Michelle Branch, Martin Scorcese presents- Jimi Hendrix –“The Blues” which Eddie produced and engineered, Jimi Hendrix –“Live at Berkley,” Led Zeppelin- “How the West was Won”. Jeff Beck, Eric Clapton, The Cure, Buddy Guy and the Pixies also owe their thanks to Kramer for producing and engineering some of their best-selling albums. He is currently working on Acoustic Experience- a contemporary acoustic remake of Hendrix’s songs with artists Jason Mraz/Crosby and Nash, Mike Mc Cready and Brandi Carlisle, Grace Potter, Rafael Saadiq, Heart, Shinedown, etc. As a skilled photographer, his work is regarded as a highly valued collector’s items that have been exhibited in some of the world’s most prestigious galleries and museums. Rolling Stones frontman, Mick Jagger, underwent successful heart valve replacement surgery yesterday and is said to be recovering at New York’s Presbyterian hospital. Jagger underwent a routine scan when doctors were alerted by the unexpected heart issue. The band announced the postponing of their US leg of their ‘No Filter’ tour to allow their frontman to undergo and recover from the procedure. “I’m so sorry to all our fans in America & Canada with tickets. I really hate letting you down like this. I’m devastated for having to postpone the tour but I will be working very hard to be back on stage as soon as I can. Once again, huge apologies to everyone,” – Jagger stated via Twitter. Jagger is expected to make a full recovery and the band is set to be back on the road by the beginning of the new season. Today in 1963, The Rolling stones played at Ricky Tick Club, Star and Garter Hotel, Windsor, Berkshire. This 1960’s rhythm & blues club in Berkshire hosted many influential artists which also included Jimi Hendrix, Pink Floyd, The Who, Eric Clapton and Cream. John Mansfield recalls the first time he saw The Stones. The music promoter was in search of bands to put on his newly established club’s stage. 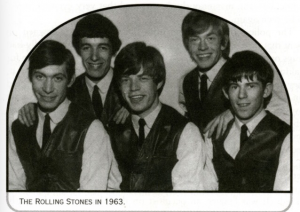 He heard about The Rolling Stones before and booked them to play at Ricky Tick for the first time in December 1962. The Stones, now a multi-million-album-selling band, got their first big break in Windsor and actually played Ricky Tick’s at least 39 times during 1962 to 1964. Today in history, The Rolling Stones self-titled debut album hit a 12-week run at No.1 and spent a total of 51 weeks on the UK charts. Also on the 2nd of May, 1964, the band made their first appearance on the US singles chart when ‘Not Fade Away’ hit the chart at No.98.